Step away from the apple-themed gift. Yes, you, Pinterest Mom (don’t get me wrong, I love Pinterest Moms, I’m one myself). As a former teacher, I can tell you that gifts are always appreciated (we actually love hand-written notes just as much as a gift card – really). But… some gifts just aren’t our thing. Another mug. An apple magnet. A cute little apple picture frame with the pretend child from the store inside. Unless it’s made by the student themselves, some of those cutesy teachery gifts aren’t actually very teacher-friendly. Teachers, like all people, have likes and dislikes. We don’t all love coffee (gasp – I know). We aren’t all chocolate lovers (I haven’t met one yet but I know they’re out there). So, instead of having no clue what to get your child’s teacher this year for the holidays, ask them. Find out what they like. While children look at teachers as some sort of alien creature that has no life outside of school, as an adult you know that we are just regular men and women doing regular things. 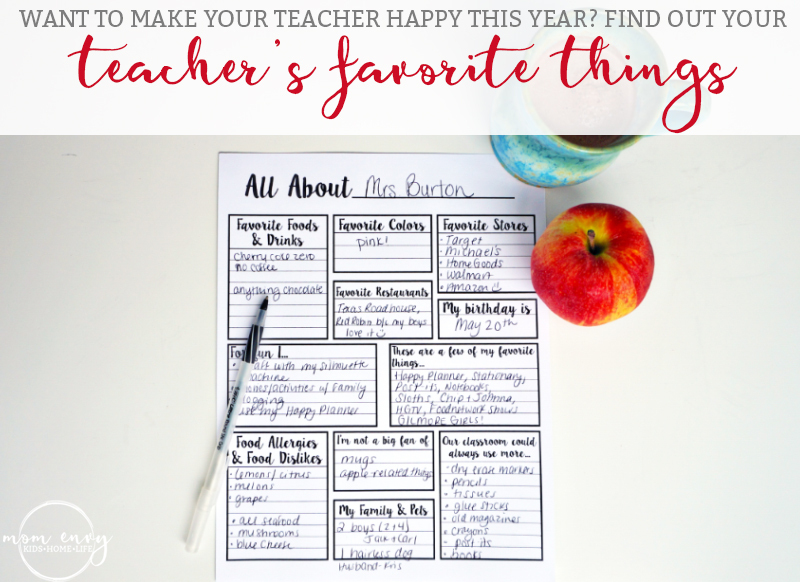 Wouldn’t it be easier to have a list of what your teacher loves, doesn’t like, and needs? As my husband says, he’d love to have an informational sheet like that from me each year for when he buys gifts. Are you part of the Moms that run the school (you know what I’m talking about – PTA, PTSA, Boosters, etc)? Or maybe you’re just a Mom that would love to get to know her child’s teacher a little better so that she doesn’t accidentally give her peanut butter cups only to find out she can’t eat them because she’s allergic. Then this FREE download is for you. Check it out below. So how do you give these sheets out? There are two different ways I suggest. 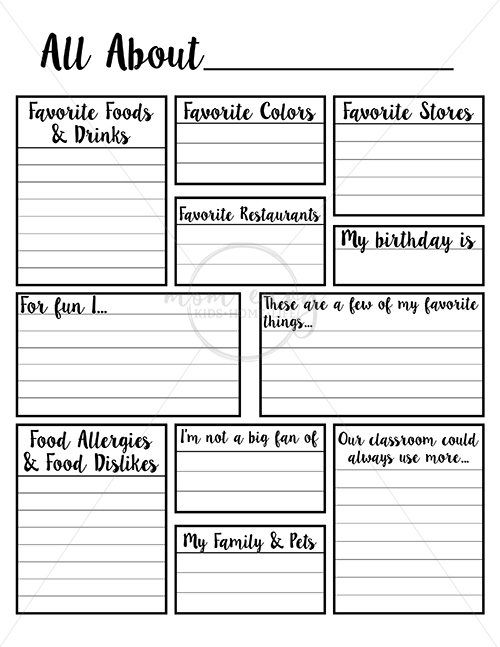 Pass out the favorite things sheet/directions towards the beginning of the year (but not the first two weeks of school, teachers are super busy at this time and you may not get as good of a response). Take all of the sheets and hole punch them and place them into a binder. Feel free to use my image above of the completed one as an example. **Understand that having a teacher fill this out is optional. It shouldn’t be forced. A teacher should be allowed to fill out all, some, or none of it. Send it out at the beginning of the year, but try to avoid the first two weeks because teachers are so busy and you may get fewer responses. It’s best to have these forms accessible but don’t put them on the school’s public website. While you want the parents of the students to have access, avoid making it publicly accessible to everyone that visits the school’s page. *Also, it’s important to make sure the papers are given to every position at the school. Sometimes special education paraeducators, student assistants, and general instructional assistants are forgotten about. I can tell you from personal experience, they are the most undervalued positions in the school. They create a bond with the students at times on a much closer level than even the teacher because they are working more closely with them. I could go on a lot about this subject, but I’ll save it for another day. 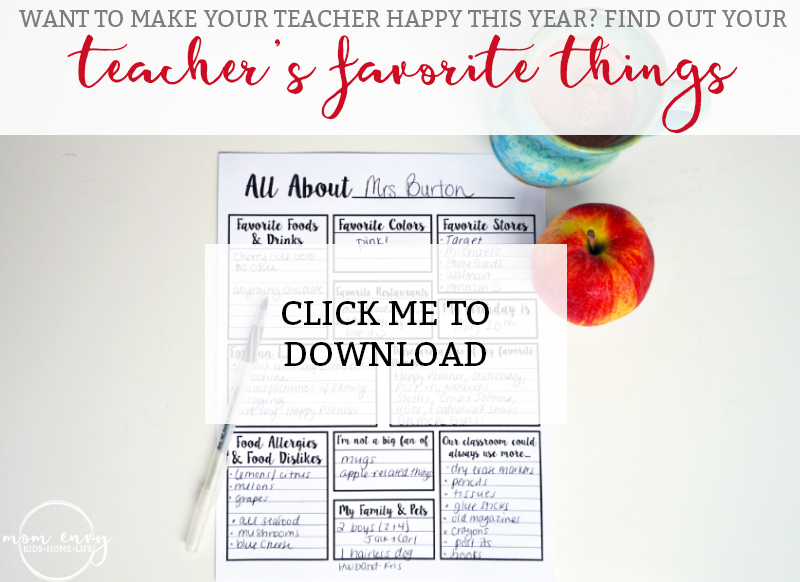 Looking for some teacher-related posts (including free printables)? I have my old Bed Rested Teacher posts available here. 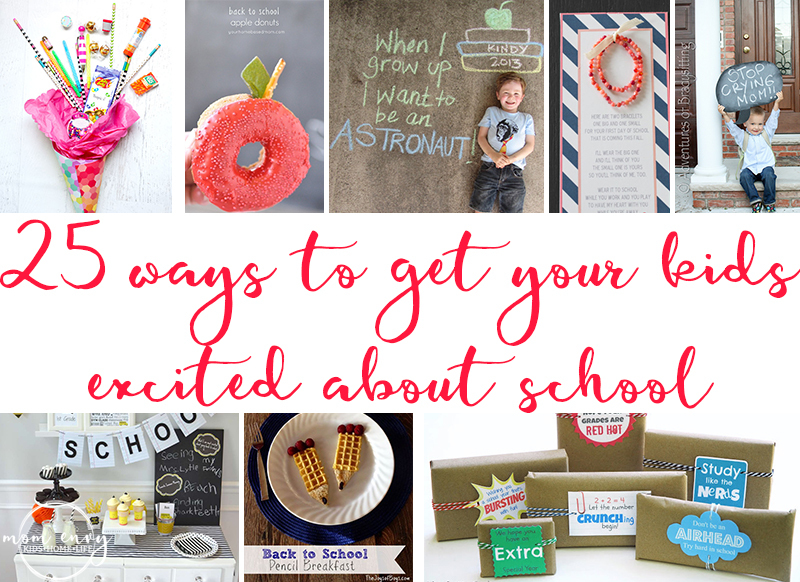 Looking for some ways to make back to school special? Check out this list of 25 ways to get your kids excited about back to school. 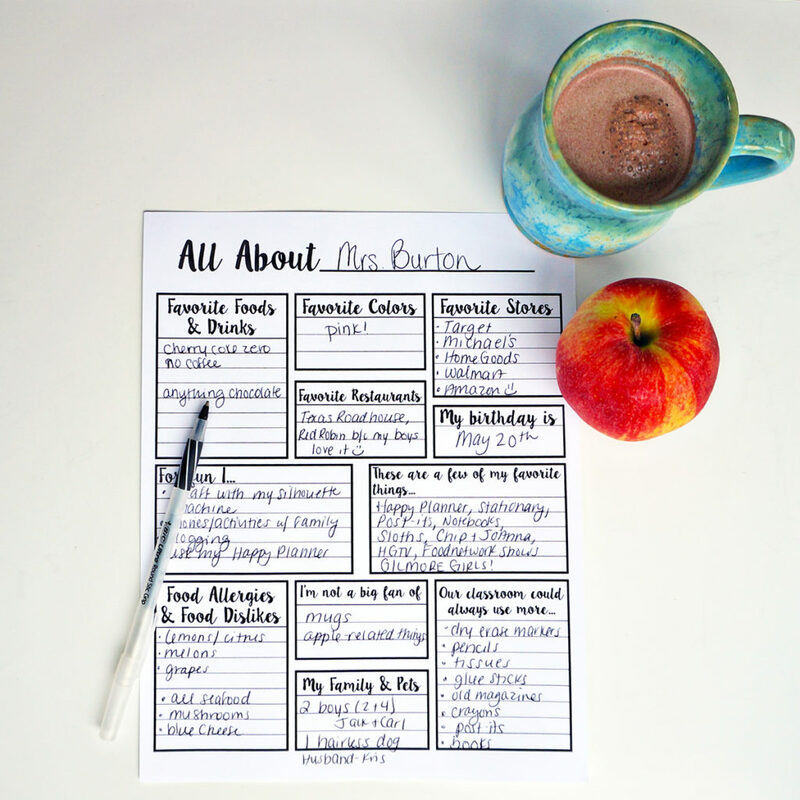 Next articleBack to School Planner Stickers – Perfect for Calendars, too! I would love this download but every time I click on it it takes me straight to Pinterest to Pin. Please advise. Thanks!